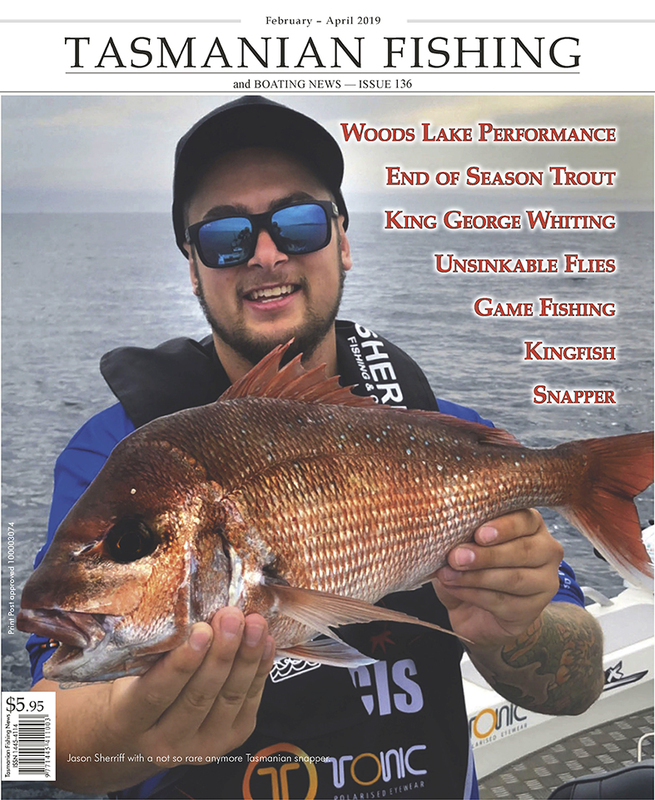 The North East Coast of Tasmania is undoubtedly home to some of the states best saltwater fishing; world class game fishing, amazing estuary sports fishing and some of the best bream fishing in the country. When we talk about quality trout fishing our minds and hearts always wander to magical western lake-tailing trout, dun hatches on Little Pine and big sea run trout on the west coast. However for East Coast trout anglers there are a number of fresh water gems closer to home that offer quality trout fishing to those willing to do a little leg work and poking about. The region has it all to offer from magical stream fishing to trophy trout waters and all within 90 minutes drive from the East Coast town of St Helens. Since the big wet of 1996-97 Tasmania, like the rest of south-eastern Australia, has suffered from a severe lack of rain. The Midlands, East Coast and eastern fringes of the Central Plateau have been especially hard hit in the last three years, with disastrous consequences for high-profile trout fisheries like Tooms Lake, Craigbourne Dam and the Coal River. Whether this can be attributed to normal drought cycles is moot: the trend to generally drier conditions has been evident since at least the mid-1980s and may well be the result of irreversible climate change. Tom Crawford takes a slightly different approach to lure fishing for trout. Vertical jigging is becoming very popular in salt water fishing in Tasmania with the release of many large and sophisticated jig's hitting the market. But very few people try this method for trout. One of the biggest problem trout fisherman face is getting their lure or fly down to where the fish are sitting. This technique cures that problem. Jigging for trout has been extremely popular in New Zealand for quite some time and has produced many good sized fish there. In this article I will give you a look into what I believe should be one of the more popular fishing techniques in Tasmania in years to come. Leroy Tirant gets beaten by his son and learns a Winter lesson. There have been many articles over time about fishing in winter. I love targeting Tasmania's fish rich lakes on clear crisp winter days, perhaps almost romanticising it, because it's quite easy once home and warm to forget how really cold it was-and how hard it was to finally find feeding fish. These can be swimming lethargically in 30 feet of water. Most of my fishing is done from a boat, but occasionally and it seems only in winter, my young bloke and I will wander around the shoreline, mainly for his sake more than mine because he loves discovering things. At five years of age he competently fishes on his own with little instruction from his dad. As with most youngsters though he can become annoyed if he thinks I'm taking over. 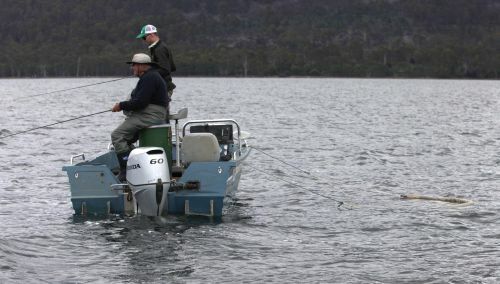 In Tasmania Art is not commonly used when referring to bait fishing, but this form of fishing really is an artform. Recently I was lucky enough to spend some time in the England in a district called Worchester. Here I was privileged to fish with one of England's leading tournament fisherman, Graham Clarke. I was to learn about and appreciate a style of fishing that has unfortunately been seemingly forgotten in this state. Bait fishing is the way many of "us" start out on our fishing journey, so it was exciting to revisit this style. Todd Lambert, President of the Longford Anglers Club, takes a look at the past trout season for both himself and his club members. Chris Reygaert on capturing one of the world's most beautiful trout. The world record for a brook trout is just over 10 pounds and anything from the wild at three pound or more is a real trophy. So maybe you should take a trip and try for one of these fabulous fish. Gavin Hicks turns Trout Bum, film extra, and assistant in producing The Source - a film by Gin Clear. I never thought one of my regular visits to Big Fin in East Devonport for a chat with Leroy would end in such a great week's fishing. But that is exactly what happened towards the end of 2008. It is no surprise to me that as a trout fishing guide my December and January book out well before the other months. The repeat clients come primarily for the opportunity to fish the Highlands tremendous dun hatches.